Over the past month I have been super busy creating 25 Thankyou tags. I was asked to make them for a High Tea function. The theme being shabby chic/pretty. I just loved making these. They turned out so lovely and are actually much prettier in real life. 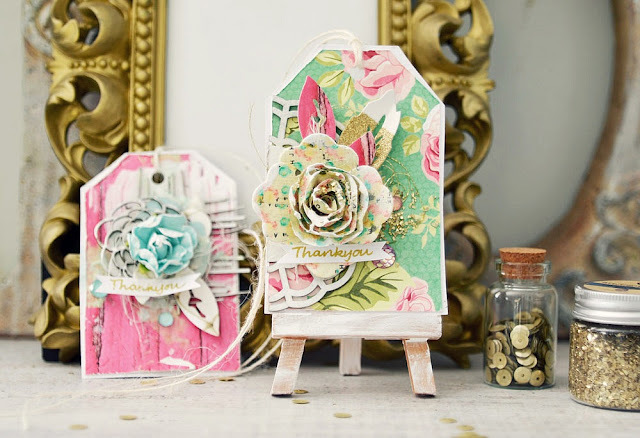 I used lots of Prima flowers along with some 2 Crafty Chipboard and Crate Paper products. Most of the background papers were Websters Pages and Pink Paislee. So here they all are. I didn't take an individual photo of each one but below are lots of different pictures of the collection. Lots of dimension as usual. I used some Art Ingredients too including the Glass Glitter and Art Stones. They all look absolutely gorgeous! wow, they are all gorgeous!! your style is lovely!